Members of Congress have increasingly remained in office for decades. Congress has designed its bureaucracy to protect incumbents, shielding them from punishment for misconduct and cloaking the institution’s dirty laundry in secrecy. Even members of opposite parties do not go after each other for ethics issues, part of a truce to avoid mutually assured destruction. Congressmen have used their power to design an institution thats first order of business is keeping current members as current members for as long as possible. Inside Congress, members have shaped the institution to protect incumbents through secrecy and even created bureaucratic offices that break the House’s own rules in order to do so. Shielding themselves from facing consequences for malfeasance isn’t about Democrat versus Republican, it’s about insiders versus outsiders. After all, with fewer than 10 percent of congressional districts “toss-ups” according to RealClearPolitics, chances are a congressman forced out of office for misconduct would only be replaced by a member of his own party anyway. In 2018, a vivid example of this bipartisan detente emerged in a slush fund congressional members used to conceal sexual harassment claims against them and their staff. John Conyers was born in 1926 and represented a section of Detroit next to Dingell’s — one that’s done even worse economically — from 1965 until 2017. That’s until the man, then known as the “Dean of the House,” was abruptly forced to resign for allegedly using taxpayer money to cover for making sexual advances on staffers. But the House had already known about that for years. BuzzFeed reported that a female employee was fired in 2015 for refusing to “succumb to [his] sexual advances.” She filed a complaint with the House’s Office of Compliance, which is designed to hear such complaints of mistreatment and received a $27,000 settlement to secure her secrecy. In fact, the Office of Compliance ran a settlement fund that routinely paid off congressional employees to stay silent about alleged misconduct. It paid $1 million in settlements involving congressman-led offices in the last 20 years, according to data it released under pressure after a media storm following the BuzzFeed disclosure. For a payment to be processed, it had to be voted on by the leaders of the Committee on House Administration. For many years, the leader on the Democratic side was Rep. Bob Brady of Pennsylvania. In the last Congress, on the Republican side was Rep. Gregg Harper of Mississippi. But even when Congress finally seemed to be coming clean, it wasn’t. The list of settlements published by Harper’s committee, which still did not include the name of the congressmen involved, omitted its largest one — $220,000 to resolve allegations of sexual harassment against Florida Democratic Rep. Alcee Hastings. In fact, the statistics were missing a massive portion of the settlements because Congress’s own human resources lawyer was helping members seemingly break the House’s rules to pay settlements in a way that avoided a paper trail. The lawyer, the House Employment Counsel, advised members that they could pay off would-be whistleblowers by having them resign but continue to sign paychecks for nonexistent work, rather than having the Office of Compliance make a one-time payment from the special settlement fund. 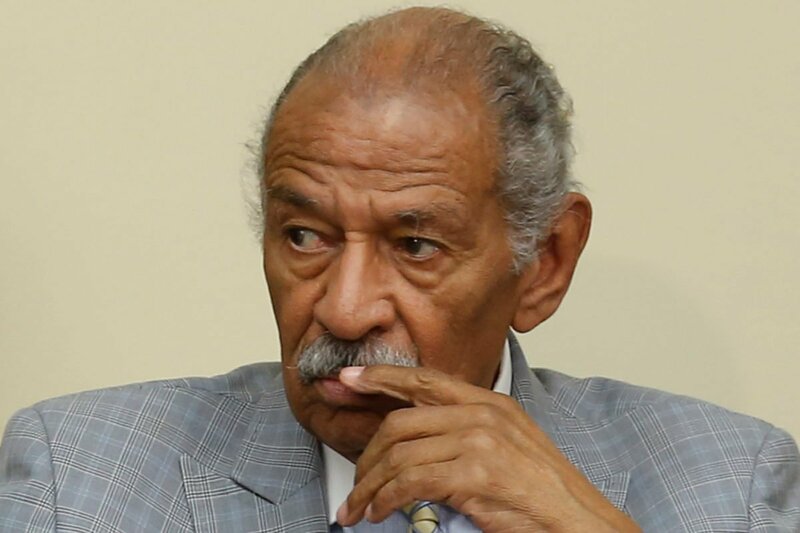 The released data didn’t include the very settlement — the Conyers money — that spurred the interest to begin with. Nor did it include some of the most prominent instances that hit the media after Conyers — those of Arizona Democrat Raul Grijalva and Pennsylvania Republican Pat Meehan. Harper’s office wouldn’t explain. Eventually, the House Ethics Committee quietly acknowledged that the House’s human resources attorney was advising congressmen to break the rules. In December 2018, the committee filed a report on ex-Rep. Elizabeth Esty, who allegedly gave a golden parachute to her chief of staff after he allegedly punched and threatened to kill a female staffer. The Connecticut Democrat surreptitiously gave him the payout by leaving him on the payroll after his employment had actually ended. Esty said the House’s lawyer suggested it. Advice to members to have someone “‘remain on the payroll as paid severance for __ month(s) without reporting to work or performing any services,’ [is] in violation of House Rule XXIII, clause 8. 217,” the ethics committee said. The ethics committee has its own reputation for being where accusations against members go to die, killed off by their fellow members. A similar calculus occurred when Democratic leaders pushed back against censuring Rep. Steve King, an Iowa Republican who was accused of making racist comments. Censuring King could set a precedent that might make it difficult to justify inaction against their own ranks, such as Democratic Rep. Rashida Tlaib of Minnesota, for seemingly anti-Semitic rhetoric. The complaint alleged that McMorris Rodgers, a Washington Republican, improperly used her incumbency to fend off challengers by having taxpayer-funded aides work on campaign business. Schuman said that people realized that the House Ethics Committee was comprised of members protecting each other, so the House created the Office of Congressional Ethics (OCE) and required that it be run by people who were not members of Congress. It can’t punish wrongdoers, but it serves as a gateway to the ethics committee, conducting preliminary reviews of complaints and referring serious ones to the committee. “One thing that made it good is its reports must be made public eventually,” Schuman said. But Issue One said that soon after, “House Republican leadership tried to covertly gut OCE” with a subtle wording change that would lead to a more partisan ethics board. McMorris Rodgers, a top member of that leadership, was in favor. “More than 21,000 private citizens have contacted OCE since 2009—and OCE has referred only 74 cases to the House Ethics Committee for continued review after performing due diligence and vetting such complaints,” Issue One wrote. Unless she was given special permission from the Ethics Committee, taking a personal gift — including free legal work — from a company could be a major ethics violation. Yet the ethics committee refused to say whether it had given her special permission, making public accountability impossible. The now-chair of the ethics committee, Florida Democratic Rep. Ted Deutch, was also involved in the Awan scandal. The broader political climate is also responsible for current members of Congress being elected again and again, regardless of their performance. Rising ideological polarization means that in many districts, a challenger from the opposing party no longer stands a chance. USA Today noted that in 2016, there wasn’t a single competitive House race in numerous states, including the “swing state” of Ohio. Dave Wasserman of the Cook Political Report noted that, while this is often chalked up to gerrymandering, it’s more often because of what he calls “self-sorting”: people are increasingly choosing to live in bubbles, surrounded geographically by people with similar political opinions. In those safe districts, incumbents rarely face a serious challenger from a member of their own party. Out of 378 congressmen seeking re-election in 2018, only four lost in a primary — most famously New York Democratic Rep. Joe Crowley lost to Rep. Alexandria Ocasio-Cortez. This is in part because the increasing role of money in politics favors incumbents against outsiders more than it has helped one party over the other. Special interests, like oil companies and unions, give to incumbents some 90 percent of the time. All of this has added up to a scenario where once a politician gets into Congress, he stays there for longer — regardless of performance. In 2012, 147 sitting lawmakers had been in office for 20 years, compared to only 26 lawmakers a century prior, according to a review of historical data. Democrats in particular began to cling to offices for decades. Thirty-two out of the 41 longest-serving congressmen are Democrats, and their constituents seem unable or unwilling to find a single better person for the job. The growth of grievance culture and identity politics has also been employed by some poor-performing and unethical lawmakers to rally voters and distract from their own conduct. One-time tax-writing chairman Rep. Charlie Rangel of Harlem, a Democrat, was one in a line of politicians who rode out a scandal that otherwise might have taken him down by invoking racism. But the poor representation that can result from one-party rule in a given district is not just a problem with Democrats. Anywhere ideological uniformity appears, the result is the same. Mississippi — a state that is nearly as conservative as many cities are liberal — elected Republican Sen. Thad Cochran continuously for 44 years. Cochran was chairman of the Committee on Appropriations, the most powerful committee in the upper chamber in the legislature of the most powerful country in the world. This means in 2017 and early 2018, the nation’s appropriations policy was managed by a 79-year-old whose memory was failing so badly that “at one point he needed a staffer to remind him where the Senate chamber is located,” in the words of Politico. In October 2017, from his hospital bed, he sent — through aides — assurances that he planned to run for re-election.